Our last school visit in the run-up to Christmas was to Anston Park Juniors, very good friends of ours and great fans of our books. It’s a big school, and with 300+ pupils sitting in front of us, we launched into our Kruschmeister presentation, but not before talking about the prequel – Scabbajack. An hour and a half passed very quickly and to say the audience was attentive and enthusiastic is an understatement; they hung on every word. The next day resulted in a mega book-signing which went on for just over three hours. In fact, Kath and I had to return to base to grab more supplies! We were inundated with great feedback from the pupils, some handing over pictures and artwork they’d been inspired to come up with, others keen to show us stories they’d started and lots of pupils eager to read their newly-acquired books in bed that very night! Some special moments too. 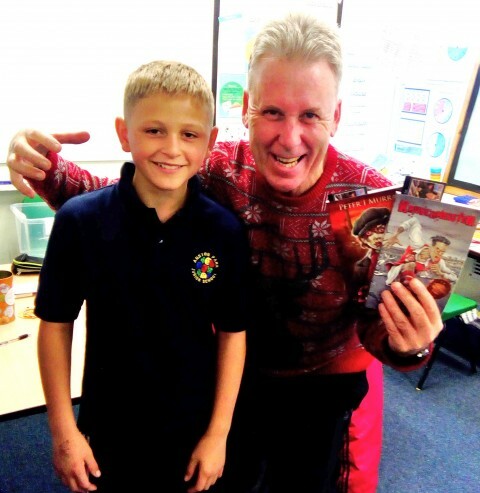 Like meeting Zak, the Year 6 boy with the same name as the hero in the two books (hope you like the picture, Zak), and Alicia, the girl with the injured leg, but still keen enough to provide Kath and I with little Christmas presents to say ‘thanks for coming’. Well…what a way to finish. Is there any wonder we enjoy what we do and just want to keep on writing. And speaking of writing, I need to get on and finish my sixth Mokee Joe book. I’m almost there, but just need a great ending. I can’t wait to have the book in my hands early next year. In the meantime, a BIG ‘thank you’ from Kath and I to everyone for a great term and we hope you have yourselves a merry (spooky) little Christmas. See you again in 2017. Kath and I travelled north to make a first time visit to the Samuel Barlow Primary School near Mansfield. In fact the school is very close to Sherwood Forest, true Robin Hood country. 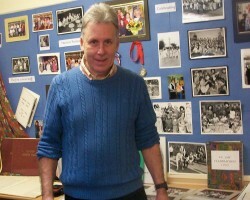 We were invited to this school by Mr Durkin, someone who is destined to become a good friend of ours. Like the other staff at Samuel Barlow, he is dedicated to making the school a real reading den, where both staff and pupils value the experience of reading and enjoying books. Unfortunately, Mr Derkin was under the grip of a chest cold during our visit on a very cold Friday morning, but still managed to sit through our Mokee Joe presentation delivered to the whole of an enthusiastic KS2 audience. We delivered our short story workshops during the afternoon and returned the next day to do a book signing. Miss Pye and the three lovely Year 6 librarians did a great job in assisting us through a very hectic and exciting signing…we are still staggered at the number of pupils who queued up to get books. We wish Samuel Barlow Primary all of our best wishes for the future and hope everyone has a great ‘spooky’ Christmas holiday reading our books. 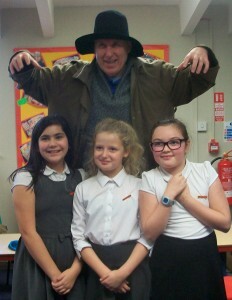 Thank you Mr Durkin for inviting us…hope you are back to full health very soon. Having escaped Robin Hood’s arrows, we quickly moved on to my home town of Rotherham and visited Thrybergh Fullerton Primary for a full day. Again, a lovely school and a lovely day spent with a relatively small KS2 audience of around 70 pupils. Everyone seemed taken up with my Mokee Joe character and lots of books were signed the next day…great! Academies. These two small village schools joined forces at Barrow Hill, just across the road from an aunty of mine. After spending a day with the two schools, we turned up the next evening to join in a great initiative of Barrow Hill Primary in holding a reading evening. 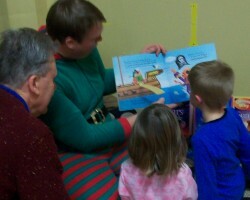 The children (and some of the staff) even turned up in their pyjamas. The event was somewhat ‘lively’, especially with having so many of the younger KS1 children in attendance, but when it came to my turn to read/tell a spooky story (Ten O’ Clock Caller), I was astounded at the silence that suddenly took over. Thanks to all at Barrow Hill and Poolsbrooke for a lovely couple of days and to the children for the lovely printed letter of appreciation they handed to me. We’ll keep in touch and hope to be back with you all before too long. Final school of the week…Redscope Primary School…my old school!It’s always a joy to be back there, reliving my boyhood memories. The new football book, Kruschmeister, and the prequel, Scabbajack, went down an absolute storm. We sold and signed books the next morning at the school’s Christmas Enterprise Fair and judging by the reaction, there’s a lot of spooky reading ahead over the coming weekend. Whilst we were at the school we took time to look over an exhibition to mark Redscope’s 60th anniversary. It was fascinating to find my name entered in the school’s registration book along with my old address, date of birth (secret!) and my dad’s name (Thomas). We also made time to check out the brass plate engraved with my name and date of me opening the superb children’s reading area just outside the school building. All of this served to make me feel quit emotional and very proud to be an ‘Old Redscopian’. Thank you Ms Walpole and all of the wonderful staff and pupils for giving us such a good time during the busy run-up to Christmas. See you all again soon.